Teacher: Pearl Jam took classic blues-rock influences like Hendrix, Zeppelin and the Rolling Stones and mixed in punk tinged influences for their own take on 90's Hard Rock. Teacher: Stone Gossard and Mike McCready are the guitar players. Teacher: All of the riffs tonight can be navigated with your familar 5 open string chord shapes. Teacher: The opening riff is a C-G-D progression. We'll see how to spice up these chords, grunge-style. Teacher: The following riff lays on top, the same chord progression but voiced in triads down the neck. Teacher: After the each D chord voicing a Dsus2 voicing is alternated with the D major. Sus voicings are often employed by Pearl Jam. 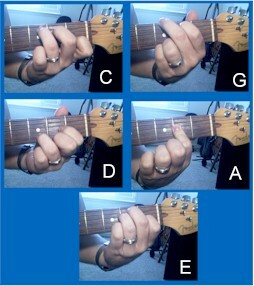 Teacher: Sus stands for 'suspended', meaning replace the '3rd' of the chord, major or minor, with the named scale tone. Teacher: Here is a loop for practicing each riff. The next section uses a sus chord as well. Teacher: The nice voicing for Asus4 adds interest on the extended A vamp. Teacher: On top of this is some classic Hendrix influenced R&B style licks. McCready does this well. Teacher: McCready will employ effect pedals such as wah, or a Uni-Vibe, MXR effect pedals. I have heard him use an E-Bow, which is a sustainer type device. Teacher: The next riff uses a wah pedal as a filter, slowly changing the effected frequency range as the riff goes on. Teacher: And the last riff, our 'solo' section. Teacher: Here is the loop of that part again. Teacher: This next lick is the type of layered rhythm guitar part Pearl Jam might incorporate. Part rhythm, part lead lick. Teacher: The lick uses the Dorian Mode. Teacher: Most of the licks come out of the Minor Pentatonic scale. Teacher: The next lick uses a nice extension pattern of the Minor Pentatonic. McCready knows 'em all. Teacher: This lick is out of that same extension pattern, one octave higher. Teacher: Just more blazing pentatonic scale stuff. Teacher: OK. Practice hard in the style of these icons of '90's rock. Teacher: If you want to learn specific Pearl Jam songs, catch me for a private lesson.